Hi, I'd like to know what species this is, I picked the plant up from a dollar store. It has squat, oval leaves and a tiny (1cm blossom) orange flower with pointed petals. I think the plant needs more sun, because in the last week it's gotten leggy and stopped blooming... I've since moved it! 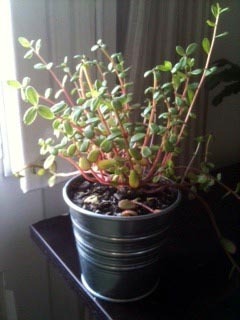 This is called Goldfish Plant, or Nematanthus and is a similar genus. Without seeing exactly what the flowers look like, it's hard to narrow it down. You can post again if you have a picture of the flower. I have also been looking to find the name of a plant similar to the one on your picture. I have seen orange, yellow and dark pink flowers on this plant. Found this (purslane) while searching for seeds on amazon. Is this the one you have? Hope it helps. Yes this is definitely purslane. It comes in yellow, bright orange, and bright pink. I simply love this plant. Fool proof. But it does not like cold weather. They are very drought tolerant still provide gorgeous bloom in hot weather. I would share photo of mine but not sure how to.